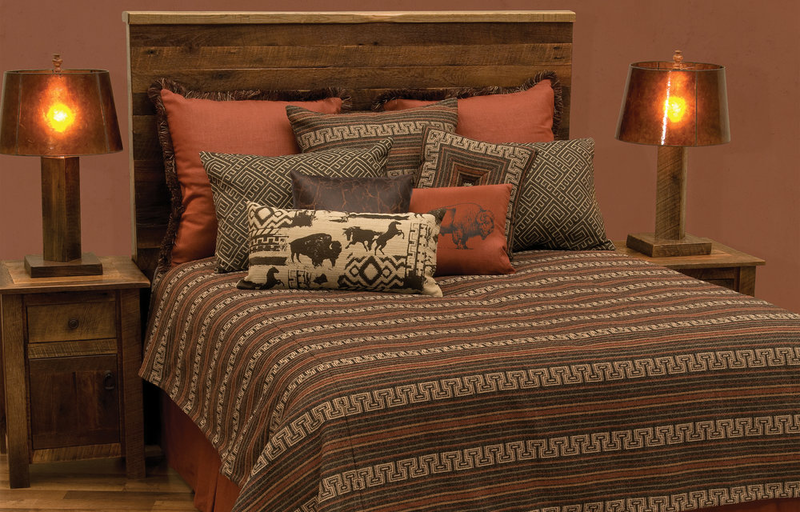 Classic, rich, and warm, the Monument coverlet ensemble combines rust-colored horizontal stripes and a tan Greek key pattern that will leave an impression. We recommend accenting the set with the coordinating reversible Button Tufted pillow, rustic Timberlake Maple leather pillows, and our Paprika Linen Image pillow (currently shown with a bison image). Other western, and Southwestern Images available. See our Linen Image pillow program for options. Monument and Zeppelin fabrics are woven Made in the USA.